More and more updates are coming my way and I'm already late for work. >.< However, I would still post this to all my readers so you can see it already. ^^ The I'm gonna be heading for work. Have fun reading! ^^ 김현중 보고싶어!! YHY: It's your first appearance in Sketchbook..how do you feel? KHJ: I've watched Sketchbook in the plane..
YHY: Oh, so you mean you've been watching me (through the show) in the plane? YHY: Now you've seen me in person, do you feel like you are seeing a celebrity/star? KHJ: I feel a little unfamiliar yet intimate too..because I've been keeping an eye on you..
YHY: I don't get the connection here but I feel happy listening to this. Have you have any thoughts on my looks after seeing me (in person)? YHY: What do you think? YHY: Recently we've seen Hyun Joong's diving appearance on TV but it's been a long time since you've been on stage on TV. So how you've been during these time? KHJ: I've been diving during those off-stage time. There's no need to plan for a holiday and I can just spend my time in the swimming pool. YHY: Is that all? A song called 'Lucky Guy'? And that's the intro? KHJ: Yeah..do I need to add more for the intro..? YHY: Hyun Joong had debuted from group SS501, right? How do you feel during your solo activities after changing from the group activities? YHY: And what's the difficult point? YHY: You've been holding your own solo concert that lasts for two to three hours and you were a dance singer. I've heard that you've been singing ballad songs in your concert too. Have you sang a lot? YHY: What kind of ballad song? It's kind of hard to imagine..
YHY: Why not sing one song for us? KHJ: Shall I sing one song? KHJ: I'm sorry but can I sing facing the opposite side? YHY: Have you ever had any ideal person whom you want to collaborate with as a singer? YHY: It seems that your voice will match well with Lee Juck's melody like Lee Juck's It's Fortunate. Do you think your voice will suit in these kind of songs? KHJ: Really? So can you ask him for a song for me? KHJ: *wide eyed* Is this a late-night show? YHY: Hyun Joong had debuted for almost 8 years and you're 28 years old now. Soon you'll turn 30, right? What do you wish to accomplish before you turn age 30? Firstly as a singer? KHJ: Yeah, it will soon be the 10th anniversary for my debut in two years time. I've been receiving a lot of love from the public, so to repay them, I want to hold a free concert in a large venue. YHY: That's good. You want to hold a free concert for fans as a singer, what about as an actor before you turn 30? YHY: Like Jihoo sunbae from Boys Over Flowers? YHY: I've been wondering, that usually singers practice their singing by imitating other singers, so how do you practice your acting as an actor? Do you use the same method? YHY: Whom have you tried imitating? YHY: The one from Wonbin..which part of the dialogues have you been practicing? KHJ: Ah..it seems like this part cannot be broadcasted..I'll just make some correction to it..
KHJ: 'If the child dies, organs will be donated. Hair to Chungcheongdo, earwax to Gyeongsangdo, nose mucus to Seoul. If you did any mistake, you should apologize to that child'..and so there's a speech in the move similar to this. KHJ: Sorry~ It's been a long time (for audience) coming out for a date but I've made the atmosphere like this..
YHY: From my opinion, it seems like I'm watching a solo comic gag. The feeling is strange. Have you talked to yourself like this? YHY: Can you show it to us? KHJ: I've tried this once when I was alone lying on the bed..like this.. Character 2 enters the room: Yah! You're still not asleep yet? Character 3 from another corner of the room: Why did you enter? YHY: *speechless* It's the 198th episode today. It feels spooky (listening to the story). 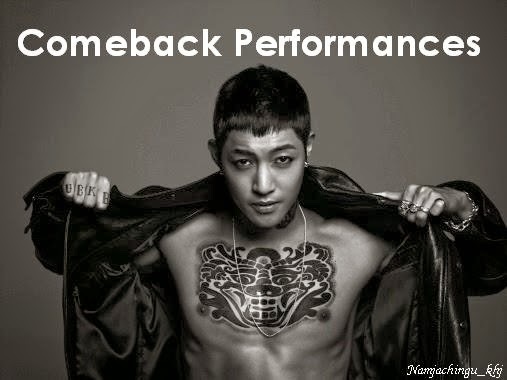 Now let's move on to the latest album that Hyun Joong had released? What is the album title? YHY: Why is it titled 'Round 3'? KHJ: It's the third mini album that I have released. After I have watched UFC, it ends at the third round, right? So this album was prepared as if it's the last album I'm going to release. KHJ: Besides this, fans have been asking me when will I release a full album. I don't have plans to release a full album. YHY: The reason being is? YHY: *nods trying to understand* Now that we have understood what Hyun Joong was trying to say..
YHY: Hyun Joong is now working with Yoon Jong Shin in the same show now, have you ever asked for a song offer from him? YHY: As if a business motive exists. But since both of you are in the same show, had he given you any advice for your comeback? KHJ: One day he suggested to me whether I wanted to cover one of his songs, and so I was choosing the songs recently, but it seemed it won't succeed since I'm too busy. YHY: *laughs* This is the last question. What is your dream? Thank you so much dear! You've done a great job! Keep up the good work!